​In an effort to produce materials for teaching Philippine music, the College of Music of the University of the Philippines (UP) had produced two series in 2016 and 2017: (1) three video documentaries of traditional indigenous Philippine music dubbed Resilient Music at the Margins and (2) three audio recordings of rare transcultural Philipine music that are to accompany a print anthology of source readings in Philippine music history. The first series was made possible by a grant from the National Research Council and was researched and directed by Prof. Dr. José S. Buenconsejo. The second was part of the grant Emerging Interdisciplinary Research on Philippine Arts and Culture that was provided by the UP Office of the Vice President for Academic Affairs. This was produced and edited by Asst Professor Arwin Q. Tan. Both José S. Buenconsejo and Arwin Tan are musicologists at the UP College of Music. The Resilient Music at the Margins video series documented traditional music in out-of-the-way places, specifically in Southern Philippines. These were previewed in the Abelardo Hall Auditorium of the UP College of Music in the middle of 2016 to 2017. ​Each of the video production in the series is based on a particular theme and each is comprised of a series of chapters (or short films) on diverse music and dance genres that can be viewed in no specific order. 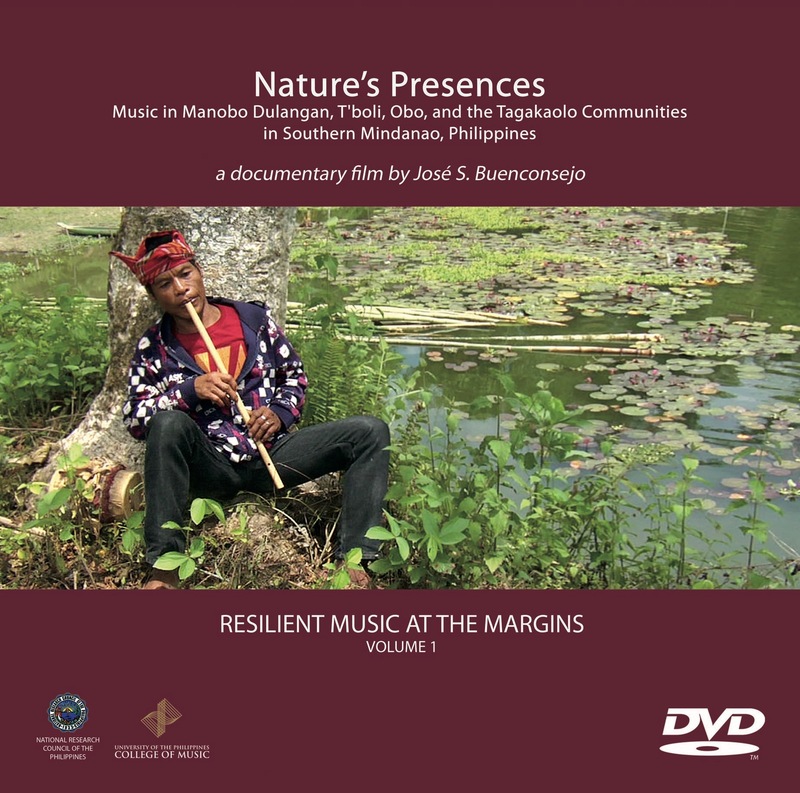 ​The first DVD documentary, titled Nature’s Presences, deals with traditional indigenous music among the Manobo Dulangan, T’boli, Obo, and the Tagakaolo in Southern Mindanao. This was shot on two digital cameras in the picturesque Lake Sebu, which is the heartland of the indigenous people T’boli. Rare footages from this region showed that traditional music remains practised despite the rapidly accelerating and deep Visayanization of places where the T’boli have been the first to settle in prehistory. Songs learnt from the ancestors are still acquired through imitation and these have been put to a number of pragmatic uses, from managing negative emotions (thus aesthetically transforming raw sentiments like anger to the level of art) to the tasks of putting a baby to sleep and of indulging one’s self in leisurely music-making after work. Some songs are the basis of instrumental music like that rendered on bamboo polychordal zither togo, while others, especially those played in whistle flute sloli, disclose human attachments to nature and with Others. Aside from songs, these people have rhythms that propel dancers who move as a mimesis of myths from the distant past, notably that of T’boli madal tahu which is about the creation of the world and of the symbolic passage of death to life or fertility among the Tagakaolo. These “rhythms” are also simulated via delicate and undulating melodic contours on what is now an endangered music instrument of the Philippines, the lip-valley flute. Quintessentially archaic, this music depicts the sounds of small creatures in the natural environment– the bird, the snail, the squirrel, and the cicadas of this relatively wooded area. ​The second video, filmed in Minahaw, Bonobono, Bataraza, Palawan on 12-16 August 2016, is titled Sound Tenderness: Music of the Non-violent Pala’wan Community in Southern Philippines. This video highlights the idea of music conforming with the non-violent nature of Pala’wan culture. Pala’wan traditional music is very delicate and tender, save the boisterous gong and drum in celebratory dance and, in former days, rice wine drinking feasts. In Palawanun society, negative emotions like anger are not channeled to violent acts–men and women nor children never hurting each other–but by repression, a number of times of which has led to tragic suicides. Palawan people rationalize that acts of suicides are “hereditary,” i.e., if parents commit suicide, then children would most likely follow them. This documentary suggests that the predisposition to suicide is not genetic but is underscored by the value for social conformity. Palawan music is a compelling evidence of this. Music, which is often seen as providing a moment of forgetfulness to sour interpersonal relations, is not a solution to suicide. For a society who values working in groups, alienation from society is the most painful human experience. Rather than forgetfulness, music accentuates the remembering and feeling for togetherness, the absence of which means death or embracing the opposite of society, which is nature. Thus the documentary contemplates on music in the praxis of its social use. ​Cosmology in Sama culture is complex. An individual in a community has to adjust to the demands of the cult of the ancestors one is born into, the veneration of saints in sacred shrines (specifically the tombs of Moslem mystics who introduced Islam in the Philippines), guardian spirits of nature that provide them with fresh water and fish from the seas, and the presence of the jin at the margins of habitation which constantly need to be appeased. The relationships of the individual are therefore oriented to Others in nature and society and reveal a sophisticated indigenous thinking about individual lives (inyawa) being “thrown into” a network of invisible connections with other beings in the cosmos such as the jin (nature spirits), umagad (lost souls), ombo (ancestors) and kembal (twin-spirit).